I have lots of opinions about education, but one of them is definitely not that every family should homeschool. So, I’m not actually trying to convince anyone to join our bandwagon. However, lots of our friends and family are curious and genuinely concerned as to what it’s all about, why we chose it, and why we keep on doing it. In lieu of having an hour-long conversation, or handing them a book that they wouldn’t really want to read, I thought it would be fun if I had something tangible but brief to put in their hands and let them read. The following paper was the result. The title question, “What’s a nice kid…” was actually posed to my daughter one morning by a repairman who was at our house to fix an appliance. She thought it was funny. But her response only left him more confused. After all, what in the world is homeschooling? Well, we didn’t ruin her. Far from it. We weathered that bout of panic (and a few more over the years), and we are now totally happy we decided to home school. Looking back from the vantage point of having finished (this June 2004 my youngest graduated from high school and is headed for Georgia Tech in August), my husband and I both know that there was simply no better choice for us. The following paper, composed in 1992, still expresses my core thinking about the crazy, creative, mind-bending, soul wrenching, character stretching, hilarious path we followed known as homeschooling. When we first heard the term “homeschooling,” it was through some friends of ours who had decided to try it. “Poor Al and Ellen,” we said. “They’ve gone off the deep end for sure.” We felt sorry for their kids stuck with parents who had seemingly been swept into some ultra right-wing, fundamentalist activity. Then the wave hit us. Avery heard educator Dr. Raymond Moore on James Dobson’s “Focus on the Family” radio show. It took only a few minutes of listening before he found himself taking notes. Homeschooling was nothing like we had imagined: parent with chalk in hand standing in front of a blackboard holding “class” for seven or eight hours every day. It, rather, was a totally different approach to education. Chiefly homeschooling is tutorial. It is one-on-one. It is this relationship that saves so much time. Some people are amazed that most homeschooling is an eight or nine o’clock until noon affair (with less in the very early grades and more in the upper ones). But many studies have shown that when a child has an extended illness and must be home-tutored, the student keeps up with just three or four hours a day of schoolwork. The reason is really simple. Much of the time taken up in a public school classroom is managerial. Taking up twenty-five papers takes a little longer than taking up one. Multiply that by practically everything you do and you’ve got a significant portion of a day used up in sheer management. Then there’s the busy work given the brighter students so the slower ones have time to catch up. And there’s busy work just to keep them busy. It adds up. Our children spend from two to four hours in the morning every day with formal schoolwork and that’s all. One author I know recommends (for the elementary years) spending around one hour for every grade they are in school in actual sit-down, concentrated, formal learning. Learning continues throughout the day, of course, but not where the children are necessarily aware of it as such. In the afternoons we often do fun things like science experiments (the children don’t consider that schooling), or we read books together, or work on some project they have thought up. Sometimes I can’t get them to quit. Sometimes it’s impossible to untangle what is “school” and what isn’t… and we wouldn’t want to. 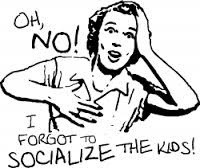 Of all the questions people have asked us about keeping our children “out of school,” the main one is, “What about socialization?” I believe it is important to realize that Laura Ingall’s parents never worried about her and her sisters being “under socialized.” They were concerned about character development. Socialization is a modern term dreamed-up by modern psychologists and we might do well at least to ask some questions about it. To begin with, to whom do you want your child socialized? To other five year olds… or to you? From whom will your child best learn manners, kindness, self-control, when to be quiet, when to be assertive? In other words, from whom will he best learn maturity and good character? The cultural wisdom of our day says to let the child spend the majority of his time with peers. Peer relationships become the main course of life, with family being served-up as an extra dish on the side. Homeshcoolers think these portions should be reversed, especially in the early years. There’s a whole slew of psychologists (with all their PhD’s intact) who say the opposite of what you tend to hear on Good Morning America or read in Redbook. Maximize family time (in quantity as well as quality), minimize time with peers and you help create independent thinkers who know who they are. The key idea is to avoid “peer dependency,” i.e., the inability to think for oneself. We complain about teenagers being peer dependent yet we have actually bred them that way. We have socialized them primarily to their peers from the earliest age onward, and then we wonder why family values take a back seat so swiftly and easily when those teen years hit. We’re hyper for them to “fit in” for the first ten years of their life, and then it is we who pull the switch-a-roo and say, “don’t you dare fit in” now that fitting in involves fooling around with alcohol or drugs or sexual promiscuity. We have changed, not them. They were given a maximum amount of free time to spend exploring, and very few places or things in the house were off limits (from banging on the piano to hammers and nails). They had highly responsive parents who spent time answering any questions they had or helping them find the answers. They spent a minimum amount of time with people their own age. This last point knocked us for a loop. At that time we, too, were true believers in this myth called socialization. We were just beginning our journey. Socialization is no longer a concern of ours. However, if by socialization you simply mean a chance to make friends outside the family, most homeschoolers have no difficulty. Just think of all the extra-curricular activities you can name in which a homeschooled child might participate. From church, scouts, 4-H, swim teams at the Y, to dance or karate lessons, there is almost no limit to the menu. And most towns now have homeschooling associations that provide a variety of activities and get-togethers. Ours takes more field trips than we have time for. Homeschooling, I believe, has simplified our life in many ways, but we find ourselves still trying to pare down our activities, not bolster them. *Note: I have been unable to find online the original article that Dr. Moore referenced, but for a related treatment of a similar topic here’s Raymond and Dorothy Moore on A Different Look at the Mental Health of Children. The first item listed in the Smithsonian study – free time to explore – was something we already firmly believed in. But unstructured, free time for children in our culture is dwindling in popularity. It too often loses out to structured classes in gym, ballet, t-ball, art, you name it. For a ten-year-old that’s one thing, but for a five-year-old it is quite another. Sandlot baseball has fallen by the wayside. Today’s little ones are often leading highly scheduled lives, and to top it off, when they have some free time, they unfortunately have a button they can push which brings automatic entertainment. Never has a group of children been so completely entertained as this generation. Neil Postman writes in his book Amusing Ourselves to Death about the insidious effects of TV on our society. Children expect to be amused and entertained to the point that a Sesame Street mentality has seeped into most all our activities with children. Schools themselves are trying to be more “entertaining,” challenging and interesting isn’t enough. If math books are not printed with neon colors the children don’t like them. They’ve become addicted to being catered to, coddled, and constantly entertained. When I taught a class for Vacation Bible School at our little country Presbyterian church last summer, the junior high literature I was using was sometimes printed sideways on the page and had such flashy colors or designs behind the print that it was occasionally hard to read. Sure, a little of this is fine, but the feeling I get is that we have to dance a jig and do a rap just to get their attention. Forget challenging them. Oh, you may say, but my child only watches educational TV. My kids love Carmen Sandiego, Wish Bone, and other such shows at my house, too. But Postman quotes a study of a group of children divided into three classes: one class watched a videotaped lesson on TV about whales, the second class heard only the audio to the same lesson, and the third simply read it. The classes were later tested for recall and comprehension. It was the class that read the lesson who remembered and understood it best. Though the TV program, at first glance, might seem to engage the child’s thinking on more sensory levels, it was shown that TV viewing is more passive. Reading, on the other hand, demands that the reader form his or her own mental pictures, filling in the sounds and sights with imagination. Educators think that the greater demand placed upon the reader (in comparison to a TV viewer) calls forth a deeper engagement with the information being communicated. Today, we are trading in both reading and real life experiences for being passively entertained. Children aren’t catching fireflies as often as they used to. They know what the African wildebeest looks like on TV, but have never spotted a rabbit in their own backyard. We need to unplug the kids and let them get bored enough to invent their own fun. Creative juices just don’t flow until there’s nothing else to do. If they can flip a switch and get instant boredom relief, they won’t ever think hard enough to invent their own game, their own project, their own fun. TV and all electronic games give them instantaneous relief from the age-old question of, “What can I do?” But relief is so short lived! When the show or video game is over, what do they have? They have not woven a hair band, nailed a rabbit-box together, built a Lego spaceship, helped bake a cake, written a poem on how bored they are (which the whole family quotes years later), drawn a cat, watched Dad work in the basement, hoed the garden, played fetch with the dog, climbed a tree, read a book, done their chores, piddled on their next 4-H project, watched the sun set, or caught that firefly. We have a TV and we love to rent movies. But the TV stays turned off an awful lot, too. I’m convinced it takes a certain amount of planned boredom to get them really going. What, you may ask, does this have to do with homeschooling? Homeschooling lends itself to greater blocks of free time for the child. Ours get through school pretty early, usually by lunch. Then, except for chores, they have that “free time to explore.” If, that is, the electronic instant-boredom-relievers remain off. And the exploring is at home, the seedbed of creativity for the child, where all his “things” are, where he feels secure, and where he can ask any question. Psychologist James Dobson says the highest form of play for a young child is working along side his mom or dad at some real task. Parents intuitively know this is true. We sometimes squelch this wonderful motivation toward work because the sincere efforts of a three or four year old are often more hindrance than help. But the joy of working along side each other is built at this early age. If squelched when the child is so young and tender, the desire may be lost forever. Work is as essential to the child as play. It is the key which truly unlocks the child’s self-esteem. Perhaps we have been propagandized out of making our children work hard by old tales of farmers who wanted more children in order to have more “field hands.” Child labor laws, we all know, were not laid down for naught. But most parents of our generation are not in danger of over-working their children around the house. Most of us are going to err in the opposite direction. Children don’t suffer from heat exhaustion nowadays unless it’s on a little league field. And, besides, take another look at those farm boys and how most of them turned out. Work is what lets your children know they are essential to the family and not just decorations. They are arms and legs, not “jewelry.” They thrive on that knowledge. They thrive on the feeling that they are valuable members of a real team. They are not superfluous; they are essential. And to top it off, they see themselves becoming proficient at real tasks in a real world. Those are ingredients for healthy self-esteem. I will always remember the first summer Rebecca was able to truly help in the spring garden planting. She had always helped before, but it was the kind of help which tended to increase planting time. But now at six, she was a real hand. We literally couldn’t get her to quit. She could point to whole rows of corn and beans she had done all by herself. Come harvest time, we went to extra trouble to keep some of her beans and corn separate. That way when we ate it, she knew she had actually “helped feed the family.” This summer at age nine, she planted, harvested, snapped, cooked and we all ate her green beans. There is a special kind of “high” which comes only from an accomplishment which took rigorous work and persistence. Where the work is manual or mental, children must become addicted early to that feeling of achievement. Homeschooling gives my husband and me larger opportunities to engender that unplugged, undrugged high. The children have more time to spend on projects. We have more time to spend with them helping. In fact, homeschooling has a sort of pervasive effect on a parent’s time. When you begin to realize that no one else is teaching your child, you know if they don’t get it from you, they won’t get it at all. This motivates the parents to take extra time, to have more patience, to spend that extra few minutes to more fully explain, demonstrate, teach, or separate out the beans. Avery and I like that extra kick-in-the-pants which homeschooling gives us. It forces us to be the way we really want to be anyhow. One summer Avery decided to teach our children to swim. We would go to the pool about twice a week and spend maybe thirty minutes on lessons and another thirty just playing around. It was a nice break from our normal routine and we all had fun. Interestingly, we got some comments from other parents that were indicative of our times. “Oh, I could never teach my child to swim – he would never listen to me!” or, “My child wouldn’t take me seriously enough to learn from me,” and, “I think my child needs a stranger to teach him so he’ll really work and not goof-off.” Avery and I were surprised by how sure these parents were that their children could not learn a skill like swimming from them. Not one of them said it was because they lacked the expertise; rather it was the child himself who lacked. And in what was the child lacking? Basic, old-fashioned respect for his parent. I understand the phenomenon to which these parents refer. Our children also are more awed by a stranger. In fact, our children are more awed by their daddy than by me. But by the time it gets down to me, there should be just as much respect. They can be just as obedient when they feel comfortable and secure. Back when we first were thinking about home schooling, I was having trouble with Rebecca one afternoon. This feisty four-year-old didn’t want to listen, much less obey. Suddenly, it dawned on me with horror that if I were really going to keep these children at home, they would have to be obedient or I would never survive. Then, I was shocked at myself. What in the world had I been planning to do if I did not home school? I wasn’t going to let them run wild, but I must not have been taking it very seriously. Obedient… that seemed like a nice way for a child to be, and I would certainly have aimed for it. But now, suddenly, it was a survival skill. You might say my feelings on discipline had just been shoved into a time machine and beamed backwards to the eighteen hundreds. For instance, in Laura Ingalls Wilder’s well-known books on pioneer life, it is obvious that Caroline “Ma” Ingalls was brought-up by both culture and family to believe and feel that discipline was as essential as food. I, too, believed it was important. I just didn’t feel it at a gut level. I believe that particular gut level feeling is what we have lost as a culture. We don’t feel the shock we should feel when children blatantly interrupt anymore, or talk back, or whine, or act bratty. We have been desensitized into thinking “that’s just children.” But it isn’t. It’s actually undisciplined children. The tricky thing is that there is a truly legitimate place for saying “that’s just children,” and every culture, even every family, will place the line of demarcation between what is excusable and what is inexcusable behavior at a different place. That’s why it’s so easy for a culture to gradually shift this line over a little at a time without even realizing it. Then, before you know it, a time warp in child rearing has been created and a twentieth century mama like me can hardly fathom how a nineteenth century mama like Caroline Ingalls reared her children to be so well behaved. A few summers ago I was reading Little House on the Prairie to the children. We had just finished the chapter where Laura describes traveling with her family from Wisconsin to Oklahoma Territory in a covered wagon. Laura sat in the back all day, jostled endlessly on the bumpy trail, hot and tired. She records having complained once that she was uncomfortable. Ma responded with a sharp, surprised (gut level), “Laura!” and that was the end of it. Our reading time over, I walked into the kitchen and picked up a magazine I’d been wanting to read. Headlined on it was “How to Survive Summer Vacation Traveling With Your Kids.” It was a helpful list of activities and diversionary tactics to try on your young ones in the car. It would have been hard to miss the irony of this accidental juxtaposing of Laura’s account with this article. Here’s Laura in an un-air-conditioned, un-upholstered, rickety wagon on an unpaved, rocky road with no cassette tapes or radio, Travel Bingo, or MacDonald’s playgrounds at which to stop for a break. Yet, which mom needs the most help keeping her children from whining and going stir crazy? Certainly not Caroline. We modern women have been outrageously stripped of the skills with which Laura’s mom was equipped. In fact, after reading the entire series of the Little House books, I realized they had had a greater impact on my perception of child rearing that any of the several other books I had read on the subject. While the parenting books had given me the right ideas and concepts, Laura’s narrative put flesh on them. Through her I could see what it ought to look like. I saw what it could look like. I saw new possibilities. I had a window to view an actual family back in an era when the schools, the churches, and most of your friends and family backed-up a character driven approach to child rearing. Our aim should be to rear children who are strong in character, have high values, and with whom we can thoroughly enjoy spending time. If they interrupt continually, if they whine, if they are allowed to act like a two-year-old when they are six, we shouldn’t be surprised that we need significant amounts of time “away from the kids” just to stay sane. And don’t you think children sense when they are not exactly your favorite people to be with? We allow children to be the kind of children we don’t really like, we don’t like them, then we wonder why they lack self esteem and seek it in a peer group. And the schools, in a desperate attempt to build self-esteem backwards, try to teach Johnny that he’s wonderful “just the way he is” despite the fact that he’s obnoxious. Kids are not stupid; Johnny knows when he’s not being wonderful. If Mrs.Ingall’s visited my home today, she would most certainly still be shocked at some of what our children get away with, but I was never the same after that summer afternoon. The practical implications of home schooling three children, of having them at home with me all day–every day–had sunk in. From that moment on my intention to discipline was transformed from a cosmetologist who wants to improve someone’s appearance, to a surgeon’s resolve to get the cancer out. Avery and I both went to public schools and both of us felt that Christian schools sort of isolated children from the real world. “Christian children have got to get out in the world someday, so they ought to learn from the beginning how to relate to all kinds of people,” we reasoned. We never dreamed we would end up doing something “worse”–homeschooling! Except for being taught that man originated from a one-cell organism and that life had somehow just happened, I didn’t see any harm in leaving out the religious stuff. However, two main factors have changed our minds. There are, first, moral dangers which have greatly mushroomed with time; and secondly, there’s more left out of the textbooks than we thought. That there are increased moral dangers really needs no explanation. Avery and I were sort of naive at this point. We are no longer. With New York City handing out books to first graders with titles like Daddy’s Roommate and Heather Has Two Mommies, it doesn’t take Einstein to realize something’s going on! Put this alongside the fights over condom distribution (to fifth graders in some places) and the law suits against the few public schools who are teaching abstinence (the Jacksonville, Florida public school system is being sued right now) and it begins to be evident that we are living through a real cultural war over values. When you couple all this with the consistent messages coming from the media’s moral compost heap, you’ve got a child at risk no matter where he goes to school. I now see the Christian school as at least a partial barrier against these forces. As one Christian speaker puts it, “A child is either a missionary or a mission field” when he goes to school. It seems only reasonable that whenever possible a child should be old enough to do mission work before we send him to the natives. Some children make it through the turbulent waters just fine and with their faith intact, then we use them as proof it isn’t so dangerous after all. But those who do make it are buoyed-up not by average families, but by strong families who go to extra measures to teach along side the school what they believe. They go the extra miles to build a tight family unit to which the child will be loyal over his peers or his teachers who may or may not share his beliefs. The children who make it have parents who are aware of how terribly much more rough are the waters than they used to be. And even that, of course, is no guarantee. Home schooling is no guarantee either, but at least you’ve improved the odds. I also didn’t see how a student would benefit from having a Christianity-based science or history book. Avery and I didn’t get into home schooling in order to get Christian texts. I realize now it was because we had never been exposed to them. These terrific books have turned out to be a big bonus I hadn’t counted on. Rebecca’s first real science text was from A Beka, a Christian school in Florida and a major supplier to homeschoolers. One of the first lessons was about U.S. Naval officer Matthew Maury who noticed the verses in Psalm 8 referring to “the paths of the ocean.” He decided if God speaks of the ocean having paths, then there must be some. He set out to prove it. He is known as the discoverer of the major ocean currents. Maury is mentioned in public school science books, also, but of course that’s all; just a mention, just a name. Biblical truths are woven throughout these excellent Christian school texts and not in some superficial, stuck-on way, as I had expected. What a student might be missing in a public school text is only part of what we need to consider, however. Suppliers for public school books are having trouble like never before with pressure from various groups. They are trying to walk the impossible line of keeping everyone happy by a slight slanting of history here, and inserting a bit of politically correct thinking there. From a medieval Catholic Church which didn’t persecute much of anybody (why’d we need a Reformation anyway? ), to pilgrims who came over “for political reasons,” it seems we’re afraid of stepping on anyone’s special-interest toes to the point that some history books end up a watery mush with no meat at all. It’s a double whammy: it’s not the truth, and it isn’t even interesting! (And then they wonder why the kids don’t like history). Our math text is not published by a Christian company, and so far it hasn’t mattered. Yet, it really is amazing how one group’s agenda for society can be embedded in even innocent looking word problems. Feminists are enraged if the word problems have Susie adding up Mommy’s cookies but Daddy’s dollars. But I have to put up with women always being astronauts or doctors (there’s never a full-time homemaker) and daddies who seem to grocery shop a lot. The feminists are right that many subtle messages make for a powerful influence in a young child’s mind. Shouldn’t we be as vigilant as they? When you couple public school with an average Sunday school, it’s like weaving a few, strong but spidery threads into a child’s mind. Compare that to presenting every subject within the framework of Biblical truth. As parents and Sunday school teachers of the children in public schools, we must try to bring into focus the larger picture which the children may miss. The delicate weaving in and out of truths from history, science, literature and God’s Word is up to us to reveal to them. They need to know that math is only possible because He set things up with precision, and that the very existence of mathematical principles is a great argument for the existence of an intelligent Creator. Children should be encouraged to see how the study of the organization and complexity of one cell can bring you into His presence with awe as well as an altar call. They should be taught that the central point of history is the birth, life, death and resurrection of one Man, and that all of history is the working out of His will, the stories of the faithful and the unfaithful. We shouldn’t let them out of high school without showing them that Plato for all his genius did not know God nor even come close to the wisdom which is within their touch daily through the pages of Scripture; that the belief in a created and therefore orderly universe was the driving force behind Galileo and Newton; that the Christian worldview is the actual foundation for all western science and the reason it advanced so rapidly in the late middle ages and Renaissance; and that there are powerful spiritual tidbits scattered throughout history which are fun to dig out and which electrify history with great volts of meaning. When these things are left out, we aren’t just leaving out a few facts, we’re omitting essence. Einstein was once asked who he thought was the smartest man who ever lived. He said that without any doubt, it was Sir Isaac Newton; he was the genius above all geniuses. And do you know what Newton himself once said? “If I did not believe in God, the simple examination of the human thumb would convince me otherwise.” The amazing attachment of the human thumb, with its wide range of complex motion was enough to convince the “smartest man who ever lived” that a God exists. Do you think any public school biology book would have that in it? Romans 1:20 reads, “For since the creation of the world His invisible attributes, His eternal power and divine nature, have been clearly seen, being understood through what has been made…” This is the foundation for all education. We’ve got to make sure our children don’t miss it. Freedom is always scary. It’s also creative and fun. When you keep your children at home for school, the freedom you gain is extraordinary. Your husband will probably be the only one in the family who is tied to a schedule. So, if he can take off, you all can. Avery takes off on a Friday occasionally and we go to a museum, or on some other interesting outing. We can take three-day weekends and go visit grandparents. The children and I also have the freedom to take field trips with our home school group, or perhaps with just one other family who are also on an un-school schedule. We can go places when they are less crowded; everyone else is in school! The opportunities embedded in this freedom increase as the children get older. There are many jobs or activities that an older child can do if he has a flexible schedule. From hiking the Appalachian Trail, to taking three months off regular school to build your own telescope, to modeling in a nearby city – nobody can take time off to focus on specialized projects or jobs like a freed-up homeschooler. But one of the best freedoms of all is within the four walls of your house: you can choose what you’re going to study. Oh, yes, there are always those encroaching little things like math and phonics or grammar; these must be scratched off the list pretty much on a daily basis. But I mean study, examine, look into deeply. If one of the children gets a raving curiosity about Egypt, we go full steam into Egypt. We milk it for all its worth: geography (perhaps making homemade, salt-dough relief maps), early primitive inventions (Egyptians were inventors of more things than hieroglyphs), politics, history, religion, and of course, the whole Biblical connection. Not only does the child learn about all these different areas, he learns the immense satisfaction of finding answers to questions he himself has thought up. His curiosity gets re-charged again and again. He learns to dig for it himself and to enjoy the digging. This process stands in sharp contrast to the typical school which tends to spoon feed the student. That’s the real success of home schooling. If nothing else, it keeps alive that natural curiosity and desire to learn. Needless to say, it wouldn’t be good for all subjects to be student-directed. The child needs certain things that must be done whether he wants to do them or not, whether that’s math or chores or both. Making yourself do what you don’t like to do is a muscle, and it needs to get exercised. However, first through fifth grade history, science, and literature can easily be covered with topical studies sparked by the child mixed with a few assigned books of historical fiction or biographies. What one child is studying tends to spill over to the other children through oral reports or sharing of interesting tidbits over dinner (amazing how home school changes the dinner conversation!) The younger ones are always learning from the older ones, and vice versa. Studies are oftentimes sparked by my husband or me, as well. Something we want to know about or understand will trigger a child’s research into a given area. In fact, I am now convinced that the child becomes more eager to learn when mom or dad is an actual participant in the learning too. As I learn along with them, they see my natural excitement and interest over what we read or over some science experiment we do. They watch me catch on to concepts I didn’t know before and enjoy the “eureka!” of the moment. They helped me put a history timeline together, or I helped them, I’m not sure which. All I know for sure is this whole process is a second education for me, and my role is definitely as much facilitator as teacher. My lack of knowledge in a given subject, far from being a hindrance, is a catapult into exploration. We have three children. Our youngest, Robert, is age six. He does second grade math, first grade reading and the rest is Kindergarten 101. He is concurrently listening along as I read a 5th grade novel to Hetty and Rebecca. He spends most of his time building Lego spaceships and doing his own brand of woodworking with his daddy in the basement. He can shoot a bow and arrow, and he likes to dictate funny short stories to me. Rebecca, who is nine and the oldest, is my guinea pig. I try everything out on her first. She gives me the thumbs up or thumbs down on various books. Perhaps she’ll grow up to be a book critic having had so much practice from an early age. The two things about which she is most proud are making homemade biscuits from scratch by herself, and being able to load a flintlock rifle and shoot it, too, if it’s propped-up. They all take Home Ec. Home schooling may not be for everyone, but it has definitely been right for us. With my two siblings and myself having graduated from high school, I can now reflect on just how in the heck we made it. Don’t get me wrong, homeschooling was great, but once we got into the high school years it got harder and harder for my mom to teach us subjects like advanced math (of course, my screaming and hollering didn’t help any) and anatomy. A small organization which soon became a much larger one called NCCA (New Creation Christian Academy) got us through those difficult days. NCCA worked a lot like college: you could pick and choose the type and number of courses you wished to take, and you took the left-over courses at home. NCCA, as it grew, also provided sports, prom, lots of good friends, and many other things that homeschooling parents and kids often worry they are missing out on. I wouldn’t take back any of my home schooling days for anything, but I also wouldn’t take back any of the time I was at NCCA either because I think it is the reason my brother, sister and I were content with homeschooling through high school. After achieving a high score on the SAT and having the insane confidence to apply solely to Georgia Tech, he is now preparing to enter Tech in the fall as a freshman with a major in computer science and a minor in music. He has been playing the piano practically all his life and has won many awards for being the best at it in the world (I don’t think the awards actually said that, but only because they weren’t allowed to). Hetty doesn’t know what she is doing. She is planning on returning to Georgia College and State University for her second year and continuing to focus mainly on her major: undecided-ness. She had a 3.7 GPA her freshman year and was very active in the Wesley organization, almost all intramural sports, studying way too much and always making sure that everyone knew she was the loudest person in her dorm and that she could play the guitar as well as any guy there. Rebecca, after attending GC&SU, then staying at home a year and going to Perimeter (because she had mono and wasn’t well), has seemed to finally decide that Atlanta is big enough to handle her. She lives in an awesome apartment and is majoring in film at GSU. She regularly is asked to be a part of press people and write articles and meet famous people at the airport. She also is involved with the BSU there and has lots of friends who are just as big Lord of the Rings geeks as she is.